Get ready to shred through paper targets, obliterate aluminum cans and send spinners whirling like pinwheels with Crosman’s fully automatic Bushmaster MPW CO2 BB gun! Based directly on the wildly popular full-auto Crosman DPMS SBR M4 replica CO2-powered BB gun, this follow-up model does not disappoint. From its genuine heft, familiar controls and raging rate of fire, to its two-tone black/flat dark earth color scheme and the included red-dot sight, this thing just screams authenticity. 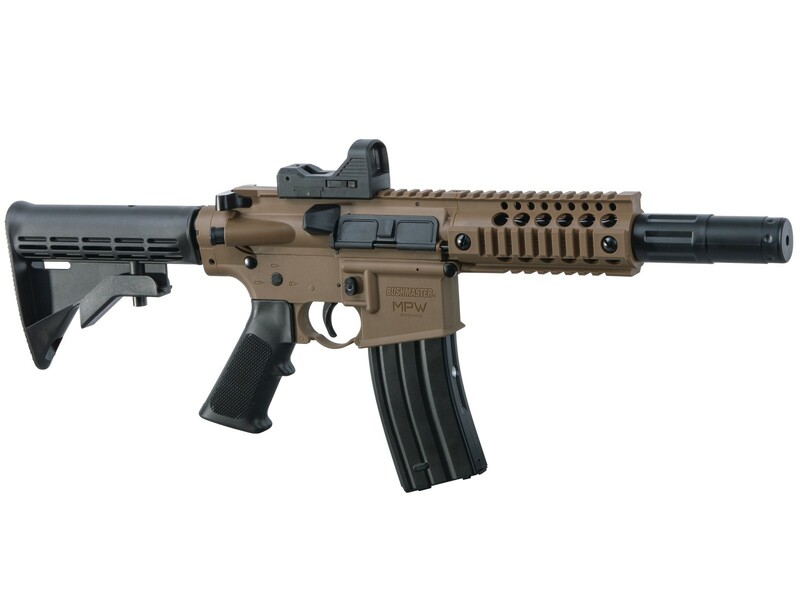 It even accepts real-steel AR stocks and grips, along with a multitude of accessories and optics, thanks to its quad rail forearm and Picatinny rail. Just load up the 25-round drop-free magazine, which also holds its two 12-gram CO2-cartridge power plant, give the ultra-realistic charging handle a pull, flip the selective-fire switch to FUN (also known as full auto) and send a stream of BBs downrange at a sizzling 1400 rounds per minute. Crosman reports the Bushmaster MPW’s maximum muzzle velocity is 430 FPS with steel BBs and, from what the reviewers have been saying, it’s wicked accurate right out of the box. So, go ahead - treat yourself to loads of full-auto BB-blasting fun with Crosman’s full-auto Bushmaster MPW CO2 BB gun. You’ll never look at a soda can the same way again. 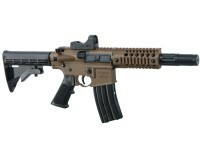 Things I liked: Gun weight is the same as the DPMS SBR with that 1.625 weight magazine. Things I would have changed: None, great gun. 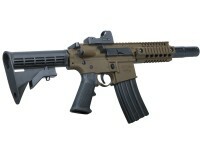 Do you know if the dpms sbr and this air guns sticks can be switched? Does this take the same magazine as the DPMS? It appears to be the same. Yes it IS the same, 1.625 lbs. yes. should be the same. is the mock suppressor fixed or removable?